It's noisy outside on Western Avenue, and yet inside a former storage warehouse in the Lincoln Square neighborhood, a group of artists are doing very quiet work. They're all printmakers, and this is the Chicago Printmakers Collaborative, or CPC. 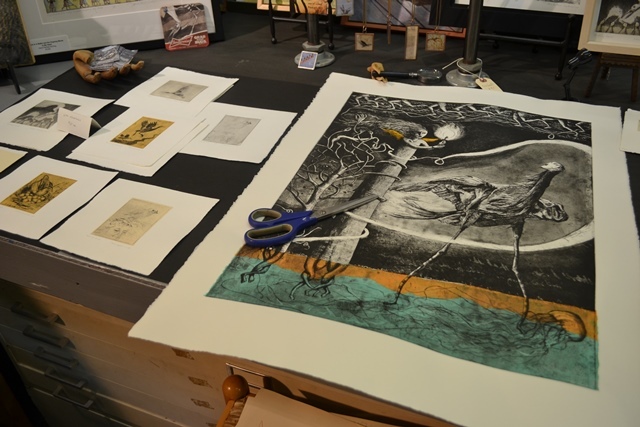 Printmaking includes lithography, etching, woodblock printing, screen printing and more. And, printmakers need a place like this because there’s a lot of equipment involved. View a slideshow of behind-the-scenes photos of CPC. Maris Lader was a professor of printmaking at Indiana University before following her fiancé to Chicago in 1989. “As I was looking for a teaching job, I was also looking for a place to make prints,” she said. But there wasn't any place outside of a university. And so, the Chicago Printmakers Collaborative was born. But what exactly is a "collaborative?" In 25 years, thousands of artists have worked at CPC. They pay a monthly fee that gives them unlimited access. “You get a key and then you can use it with 24/7 access, and I get to meet other artists printing here, and I can actually help out with some of the classes, so that's kind of nice,” said Rachelle Hill. Hill was screen printing some holiday cards on our visit. I noticed she was working on one color but I saw two colors for the card. “Actually, there's going to be more. This is the finished print. We'll have the green, and then the trees and then the brown. I'm just doing the first layer right now,” she said. Jeff Lassahn also creates art at CPC. “This is called lithography and it’s based on drawing on a stone with a greasy material, and then you use acid to etch the grease into the pores of the stone,” he said. Lassahn says that when he finished art school, he missed being in a community of artists where he could get technical advice and feedback. “A lot of times when you're printing you're going to get commentary: critical and supportive on what you're doing, and I think it really helps push forward some of your ideas to share them like that and to get the feedback on them,” he said. Duffy O’Connor has been a member since 2000. He was working on a woodblock print on our visit, but says he uses several different techniques and presses at CPC – and he teaches. There are classes running throughout the year in all of the printmaking techniques. And Deborah Maris Lader is also on a mission to correct some misconceptions about printmaking. The Chicago Printmakers Collaborative is also a print gallery. As the customers shop, more art is being made all around them. View a slideshow of work created by artists at CPC. *Arts reporting on Chicago Tonight is partially supported by a grant from the Illinois Arts Council Agency.